You have some awesome art here… the detail in each picture is immaculate. Keep up the great work. And I wish you all the best in your future endeavors. I really enjoy portraits of older people. They’re not easy to draw, and they bear so much wonderful character in their faces, as the commentator above me said.Very well done. Hey glad to see you pop up on my blog. 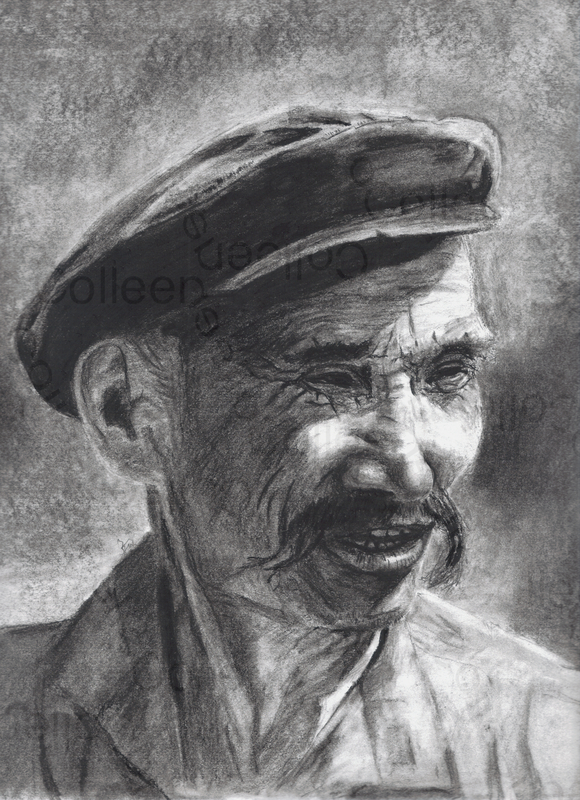 I think you may have seen my article on art where I did some charcoal. I love it, and I Just started. I wish I could create stuff like this! how did you get so good? how many years have you been doing it and did you teach yourself? You’re very talented. Nice work! This is so fantastic! I love how you’ve captured his spirit. It’s gorgeous. This is beautiful! I am impressed with the amount of detail and the astounding realism of your pieces. Thank you very much for the subscription, I look forward to following your blog! I see that others have enjoyed what I have enjoyed about this work of art. What a story is told within the lines and creases of the face of this man. Your art tells a story. I like that story. Wow – I can’t believe how unbelievably talented you are. Seriously. Great pictures! I enjoy drawing myself. You have just inspired me!! I love the weathered look on his face. Nicely done.